Davos is where the best ideas in the world come together in an idyllic Alpine hamlet to shine in a winter wonderland spotlight before the world. Salesforce brought great thinkers on trust, ethical use of artificial intelligence, and saving the world’s oceans this year. Here are 10 of our favorite moments, with links to find out more. It can be a challenge to make the inspired ideas of the annual World Economic Forum meeting at Davos a reality and actually drive change. Luckily, some local teen-agers took care of it. Last year 50 students from schools in Davos learned about environmental activism and used technology to test water for pollution as part of Davos Codes, the tech education program started in 2015 by Salesforce.org. After the famed World Economic Forum meeting of great minds and world leaders wrapped up, the students didn’t let the ecology project drop. The experiments on local water supplies as well as presentations from Benioff Ocean Institute sparked a passion for fighting plastic pollution. The students, ages 14-16, pushed their town to reverse a decision not to recycle plastics. They won. Davos leaders changed their policy, and the famous Swiss town has decided to adopt plastic recycling, after all. At this year’s Davos Codes the students will showcase their successful campaign. 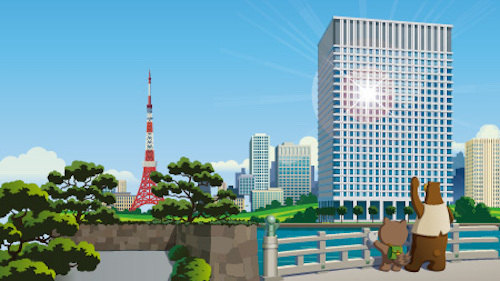 Read more on the Salesforce Blog. Some big ideas come to Davos, and this year one theme seemed to stand out. It happened to be Salesforce’s top value. Amy Weaver, Salesforce’s President, Legal & Corporate Affairs, told EY News that “Trust is the No. 1 issue on everyone’s mind” at Davos this year. Europe’s General Data Privacy Regulations changed everything related to trust and data, she said. Salesforce saw the legal changes as an opportunity to put the customer in the center of how their data is handled. “Establishing trust can be very difficult,” she said. “It can also be very easy.” Doing what you say you will do as a company is the key. Watch the interview. Amy Weaver Amy Weaver, Salesforce’s President, Legal & Corporate Affairs, and Tony Prophet, the Chief Equality Officer at Salesforce listen to participants in the roundtable they hosted Tuesday on the ethical and humane use of technology. “Technology is not inherently good or bad – it's what we do with it that matters," writes Salesforce Chief Equality Officer Tony Prophet in a post of WEF’s blog about Salesforce's multi-stakeholder approach to ethics and technology. “We convened multi-stakeholder dialogues with business leaders, academics, and society leaders to discuss how we could work together to chart a path forward.” Read more on the WEF blog. The Fourth Industrial Revolution presents challenges that go beyond technology, Salesforce Co-CEO Keith Block said in a panel that looked ahead to the human impact of innovation. “How do we absorb this technology so we make sure people are reskilled in the workplace? That people are able to embrace that technology? That we don’t have massive job loss?” he asked. Developed in partnership with WEF and The Washington Post, the panel addressed the new digital divides, how to strengthen small and medium-sized enterprises, and adapt international trade regimes to digital demands. How can the world tap into the resources of the ocean while protecting it from environmental collapse? This was among the topics discussed in a panel discussion titled “Taking Action for the Ocean” on Wednesday. Did you know? According to the Organization for Economic Cooperation and Development (OECD), oceans could contribute $3 trillion annually in value added to the global economy by 2030, supporting close to 40 million full-time jobs. Read more, including thoughts from former U.S. Vice President Al Gore, on the Salesforce Newsroom. One of the great things about Davos is the powerful minds and personalities that come together to try to make the world a better place. The above photo captures just such a moment. Marc Benioff, Black Eyed Peas founder and philanthropist will.i.am, and U2 lead singer and activist Bono huddle at The Fourth Industrial Revolution Lunch on Thursday. Finally, we have to applaud the lineup for Thursday’s lunchtime panel. 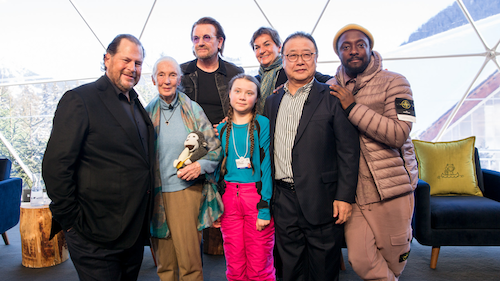 Marc Benioff was joined on the stage by Jane Goodall, Bono, teen climate activist Greta Thunberg, diplomat and environmentalist Christiana Figueres, President & CEO of Sompo Holdings Kengo Sakurada, and will.i.am. What a crew. 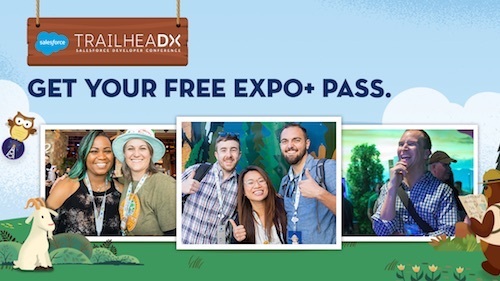 Want to read more about Salesforce events? See more posts here.